"Prior to the 1990s the Florida Keys sponge community was a lively underwater city for fish and invertebrates. Curious divers could hear the snap, crackle and pop of snapping shrimp. The noisy bottom was a sign of health for the organisms that provide nursery habitat to juvenile marine species. 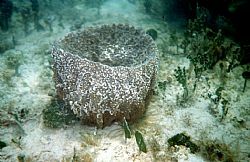 Marine sponges are not only a valuable commercial asset to the state, they are also critical to Florida marine life. Researchers suspect that the biotic sounds caused by the inhabitants that occupy the sponges may help guide the larva of fish and invertebrates to safe habitat, similar to coral reef communities..."